Cooper Barton, the 5-year-old elementary schooler from Oklahoma, who was forced to turn his Michigan shirt inside out at school because of a dress code violation, captured the attention of many, including Michigan athletic director Dave Brandon, when his story went viral Tuesday. "There is a regulation in the Oklahoma school system that if it isn't a university of Oklahoma shirt, you can't wear it," Brandon said while meeting with the media Wednesday. "What a bunch of crap, right?" So Brandon decided to invite Barton and his family to a Michigan game and Brandon said the university will put them on the video board to acknowledge them as loyal fans. But Brandon also had one other surprise. He said after hearing the story, he went to the M Den, the official merchandise retailer for Michigan athletics, and asked the store to make a special T-shirt for Barton. 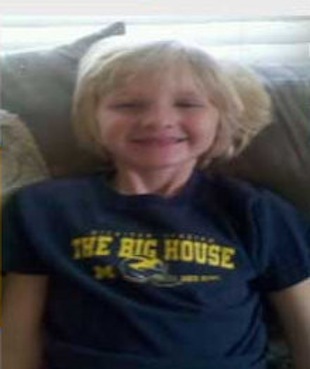 The T-shirt is a typical blue and maize Michigan football shirt, not unlike the one Barton was sporting to school that day, but when it's turned inside out, the word Michigan still appears on the chest. When Brandon demonstrated the shirt, he got several laughs and a round of applause as he shouted: "So, the hell with those people!" as he tossed the shirt into the crowd. What a great response by Michigan. They could have ignored the story or even reached out to the family quietly, but I like the fact that Brandon made a big deal about it. We all know dress codes are in place for a reason, but restricting non-offensive athletic apparel that doesn't represent one of the state's schools is kind of ridiculous, especially when we're talking about a 5-year-old. Congratulations young Cooper Barton, you are now a Michigan cult hero.